← Were jammin…and I hope you like jammin too! Yep, more jammin…we really have been busy all week! This time a zingy alternative to the usual lemon curd…lemon and lime curd. If there’s anything that will make you think of warm summer sun its lemon curd. Its origins in Britain can be traced back to the 19th century, which may well be when citrus fruits started to make a regular appearance in this country. Certainly lemon meringue pie was on the menu by then and Mrs Beeton, who is usually a good benchmark, uses what looks very much like lemon curd in her lemon cheesecake recipe. 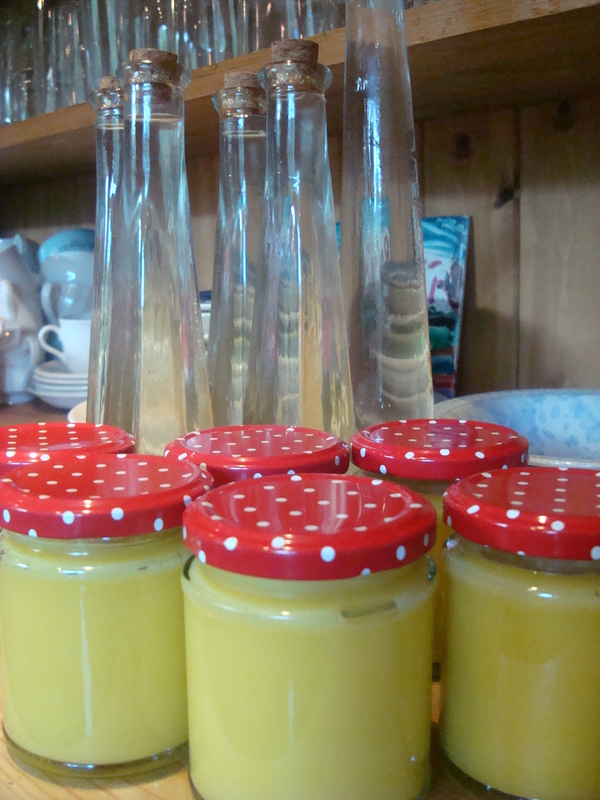 Of course it’s not surprising that us brits took to making lemon curd. If there’s one thing we do well it’s preserving and we seem to love jamming, chutneying, bottling and curing anything we can get our hands on. In the winter it is a great way to get a vitamin C hit, when there is little else fresh about. for those that can’t take the real thing. I thought about this and I’m inclined to agree, the pleasure of lemon curd is the sweet and sharp combination; with orange it’s all sweet without the kick. Whisk the eggs and sugar together in a large heatproof bowl. Add lemon and lime juice and rind and continue to whisk until combined. Add butter. Put the bowl over a bowl of gently simmering water and heat stirring every now and again until the curd thickens. It can take up to half an hour so don’t try to rush it. Pour curd into hot sterilised jars. Lemon curd should keep for a good couple of months if stored in the fridge, but to be honest ours usually disappears within the first 2 weeks!